Two Eurofighter Typhoon fighter aircraft on display at Dubai Air Show 2011. Just a few days after participating in a complex exercise in Al Dhafra, Abu Dhabi and with aircraft still in Malaysia for exercise BERSAMA LIMA 11, two Typhoon jets will appear at the 2011 Dubai Air Show 2011. 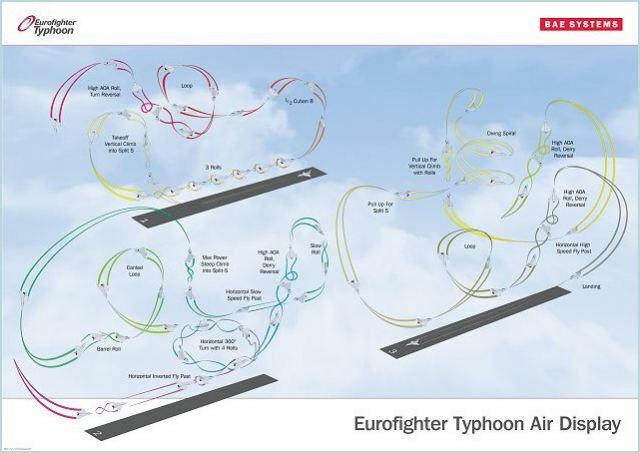 At the event, where a Typhoon will be flying daily in the air display, Eurofighter will have a large pavilion to exhibit the latest technologies developed for the world’s most advanced multi-role combat aircraft. The presence of the two jets at the most important air show in the region will be further proof of the excellent deployment capabilities of the Typhoon, already proven during Libyan operations when jets from the Royal Air Force and Italian Air Force redeployed to Southern Italy air bases to operate in support of United Nations Security Council Resolution 1973. The deployment in Libya has clearly defined the key functions of the aircraft, ranging from the vital task of air superiority, with the capability to engage multiple targets at long, medium or short range using AMRAAM, IRIS-T or ASRAAM missiles, to the newly established surface attack role, striking at long range with precision weapons. In addition, Typhoon delivered close air support to ground forces – including the supply of intelligence, a show of force and weapon attack. Participation in the Libyan operations marked the combat debut of the Typhoon and the first time it has been used as a swing-role platform. Typhoon covered two vital roles over Libya that were previously discharged by two separate platforms. The fact that the airframe is largely constructed of carbon fibre composites and light alloys to save weight – meaning it consumes less fuel and can carry more weapons was never more vital than on the five hour plus missions along the Libyan coastline and after six months of operations, Dubai Air Show 2011 is a perfect showcase for the Typhoon. • The Active Electronically Scanned Array (AESA) radar which thanks to the large aircraft nose, allows for an optimised array with the addition of an innovative re-positioner to broaden the field of regard to more than 200 degrees, some 50% wider than traditional fixed plate AESA radar systems. • The most advanced Helmet Mounted Symbology System (HMSS) which forms a key component of the Eurofighter Typhoon weapon system, improving tactical performance for Eurofighter pilots by providing essential flight and weapon aiming information through line of sight imagery. • The Meteor missile - considered the “game changer” in terms of kill probability thanks to its dynamic performances, speed and range. • The Marte anti-ship missile. • The Thrust Vectoring Nozzle (TVN) for the Eurojet EJ200 engines. 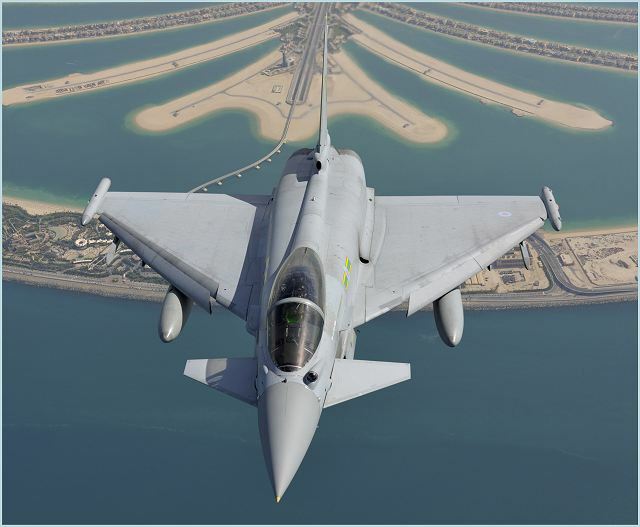 These technological developments on the Typhoon open the door to industrial collaborations between local industries and the Eurofighter’s partner companies keen to develop the partnership with aerospace and high-tech companies in the growing technology and industrial base of the Gulf region. Already in service with the Royal Saudi Air Force (RSAF), the Typhoon is considered the perfect “desert eagle”. The aircraft already demonstrates its full capabilities in the arid, hot and humid climate of the Gulf region. Thanks to its exceptional thrust-to-weight ratio, the Typhoon suffers less than other fighters in the difficult environmental conditions and is able to exploit at full its payload capability and range performances. Totally interoperable with current and future Gulf and allied air forces assets, the Typhoon is the perfect coalition fighter to offer deterrence to the Gulf States today and in the future.